On the occasion of his first solo exhibition at Galerie Daniel Buchholz the artist Henrik Olesen (b. 1967) will show a new site-specific installation. Referring to the art of representational criticism as well as to concept art, Olesen’s works are spatial interventions transforming theoretical concepts into a sculptural language. They are rather about a structural conversion, mostly on the basis of found, everyday materials (building materials, newspapers, photocopies), than about a direct and unbroken visualization of theories. In his entire oeuvre Henrik Olesen deals with the ideological conditions of personality formation and identity, with power structures that are part of the formation of individuality, and with the social processes it is regulated by. His own identity as a homosexual artist eventually marks the starting point of his considerations. 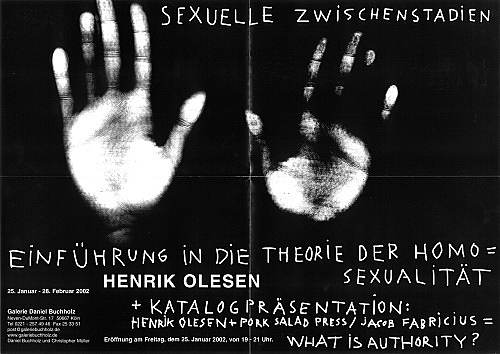 In his latest work Olesen exemplarily takes up amongst other things the famous historical sexual theory by Magnus Hirschfeld, in which homosexuality is defined as a ‘sexual interstage’. The term of the ‘sexual interstage’ implies the idea of an ‘undecided’ identity, somewhere between male and female, as Hirschfeld points out. Such terms as symptomatic manifestations of a clumsy as well as regressive wish for definition are being compared with present-day comprehension. The viewer is to evaluate them from within his current context. On the formally conversional level of sculpture this term of the ‘interstage’ for Olesen indicates an uncompleted process: something was started and has not been finished yet. During the opening we will present the first comprehensive catalogue on Olesen, that has just been edited by the Copenhagen-based publishing house ‘Pork Salad Press’. "Sexuelle Zwischenstadien, Einführung in die Theorie der Homosexualität"